So feeling inspired after @mayan and some of his diary-like posts about his journeys. I wanted to do the same. At one time, I swear Flitetest and/or the Flitetest forum had a blog section, but it is gone now. 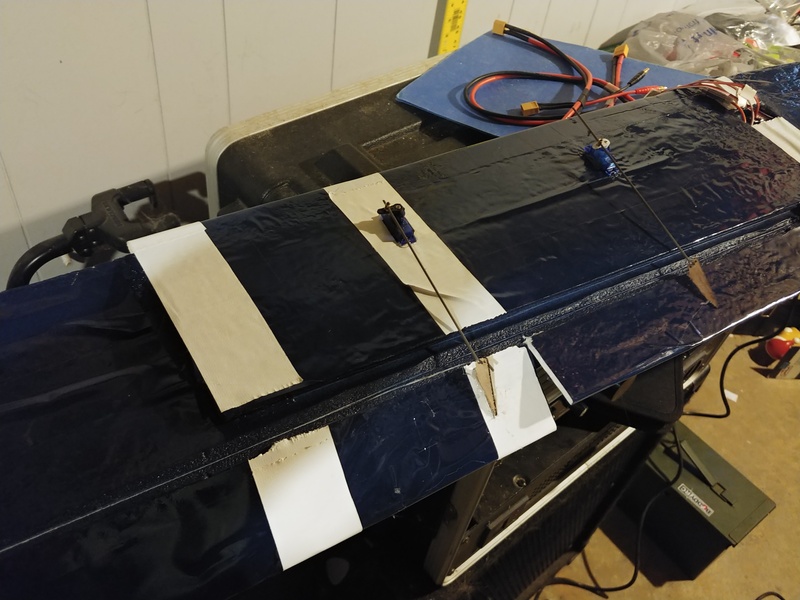 So I will kinda consider this thread my blog/journey/diary of most of what I encounter doing some RC flight and my experience with Flitetest foamboard airplanes. I think the forum will be a good home for this as I feel the forums will be around for a long time and it keeps it still accessible within the community instead of on some random blog site. Plus this place is specifically about RC flight and that's just what I wanna share. There are no rules for this. I will just share my experiences and people are welcome to read my long boring ramblings, reply and share knowledge and experience, or ignore. Doesn't matter to me. I just wanna share my experience just for my own personal reasons but also to hope/see if others may benefit from my knowledge/experience or lack of lol. I originally started in RC planes around 14 years old (1994-ish) after watching guys at a local RC plane club fly at a large local field. That Christmas my parents got me 4 channel balsa trainer complete with glow engine/glow fuel, and a Futaba FM radio. I put the plane together without much issue and ran the motor a few times but that's as far as I got with it. I was too afraid to fly it for fear of crashing and seeing this nice plane shatter into a bunch of tiny wood pieces. I eventually sold the plane some years later. Fast forward to 2015-2016 I figured to give RC planes a try again. First model to try out was a Dynam PA18 Super/Piper Cub which was all electric and a 2.4Ghz radio. I lawn darted the thing so many times and broke so many props I lost count. Rather than giving up, I just tried a different plane...the 3 channel Hobbyzone Champ. And it was with it, that I found success. Even the Champ's first flight was uneventful and near perfect. Such a great little flyer. Since the Champ I also grew and managed to have success with a Parkzone micro T28, and a Hobbyzone Sport Cub S. I even managed to score an old balsa trainer similar to the one I had as a teen. I fixed it up and made it all electric and got some good flights out of it too. It was after that, that I discovered Flitetest and constructing foamboard airplanes. It was good timing too because I was also realizing that the RC plane hobby could be pretty expensive. And Flitetest had a way to make it cheaper. 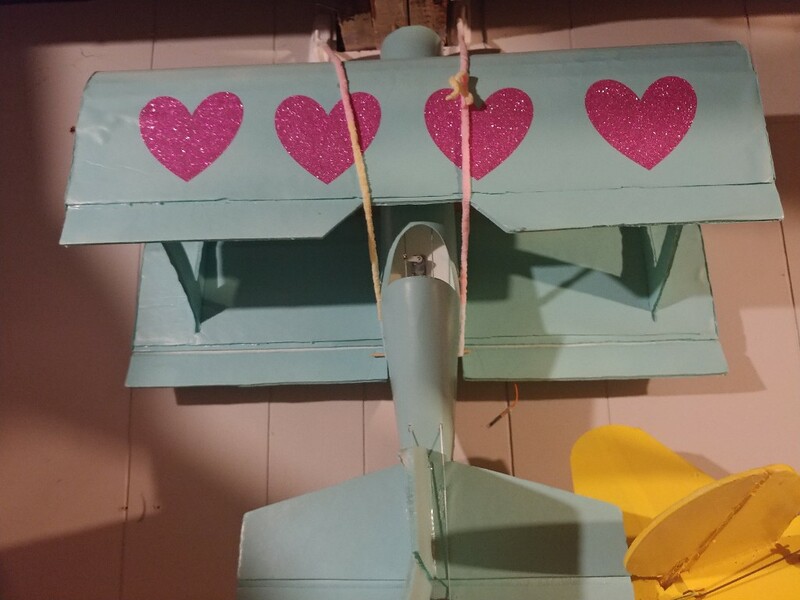 Believe it or not, my wife built the first FT plane in our family...but to her, I think, it was more of a craft project than something RC. She's very crafty and likes to sew as well as other things. She built the FT Baby Blender from scratch. We still have it and it has never been flown. Following after her, I tried the experience out for myself. I built the FT Simple Storch and the rest is history. Since my discovery of Flitetest and building the Simple Storch...I have also built the following FT planes scratchbuilt from the regular white Adams foamboard: FT3D, FT Simple Cub, FT Long EZ, FT Mini Scout, FT Tiny Trainer, FT Bloody Baron, and FT Super Bee. I have also built the FT Seaduck which was a speed build kit. AND, I have built a large foamboard glider, foamboard profile plane, and a foamboard snow skimmer. Not all of these have been flown/tested however. I am just now starting to dive in to some of these to see how they perform especially since the weather is getting better. I kind of feel too that it's nice to have a bunch of airframes ready in case something crashes. You can fly/test something else while you do any repairs to what had crashed/needs fixed. For right now, I feel that covers everything pretty good. I will report back with any updates, changes, or anything else that happens along my journey. For anyone who has managed to read this entire post, you deserve some kind of award and I promise that most future posts will be shorter. And now I continue with any "current" things going on. Stay tuned! Thanks for reading! Also, since 2016, I have been sharing some of my RC journey on my youtube channel Perkyplanes & RC. Link is in my signature. And one last thing...since getting back in RC in 2016, I feel I have really become "addicted" to RC planes. You can't have just 1 RC plane...know what I mean! @basslord1124 you got my attention. I watching you . We still have it and it has never been flown. No way. That baby deserves a maiden! I kind of feel too that it's nice to have a bunch of airframes ready in case something crashes. You can fly/test something else while you do any repairs to what had crashed/needs fixed. Not much to report on today. 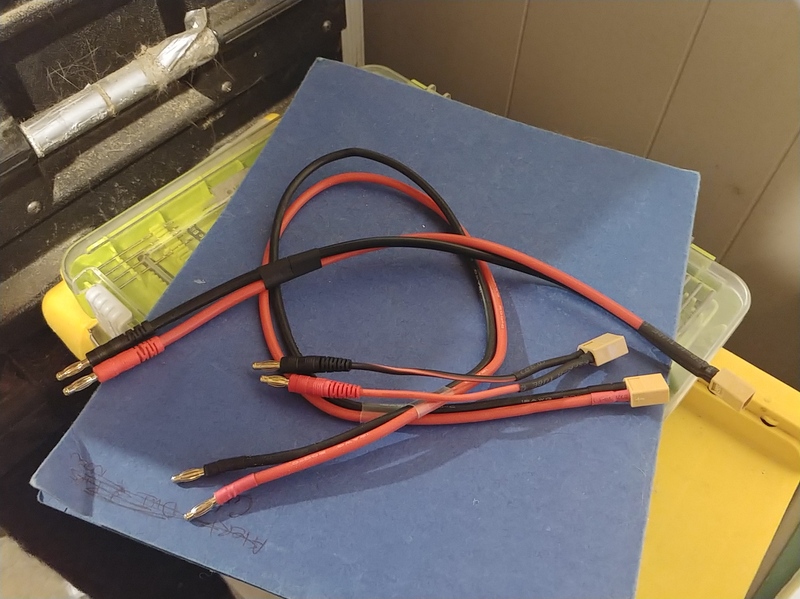 I did make me up some new XT60 charging cables. I use to have 3 and somehow I got down to 1. I have no idea what happened to them... I suppose they'll turn up some day. So I made up 2 more. Learning to solder is a valuable thing for this hobby. uh oh, my 1st stalker lol. It is true about the Blender. Pics below. 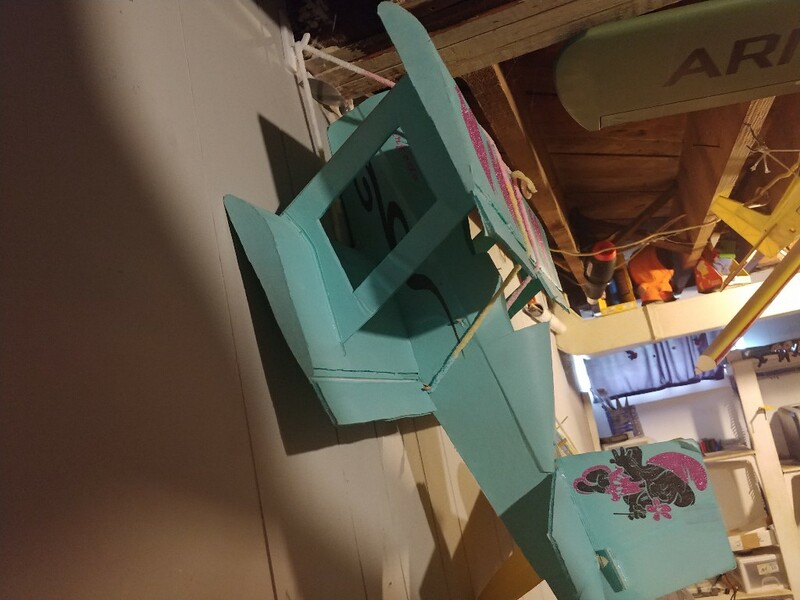 Wife built it (me and her mom helped some too), her dad put down the base paint color on it, and my wife later added the decals using her Cricut. It still needs the linkages finished and landing gear (if we decide to do it). It does still have the motor/prop... Not sure about ESC/receiver. Last time I tried to help the wife out and do something to it, she actually got mad at me. WOW, I really think she deserves to fly. Me too...although I've always been a little cautious wanting to try bi-planes b/c they are very aerobatic (I actually fly em pretty good on sims though) and I'm afraid of crashing them, especially the one she built. A lot of the videos I have seen on the Blender are kinda the opposite...just a very easy going bipe. I had a rough time getting things worked out with the Mini Scout which turned out being some build issues. Overall though, I don't think it's a bad plane at all. In fact, I had a crazy idea of creating a speedier sportier version. No dihedral wings and a more powerful motor. Whatcha think? yay or nay? I think it could be a fun little aerobatic speed demon. I will say, I've always loved to see overpowered small planes that basically laugh at the wind. A little side project that I managed to get some progress on is my Storch. I did just the usual stock setup with it initially. Recommended motor, battery, 4 channels, etc. After getting the hang of it pretty good like that, I wanted to start modifying it. 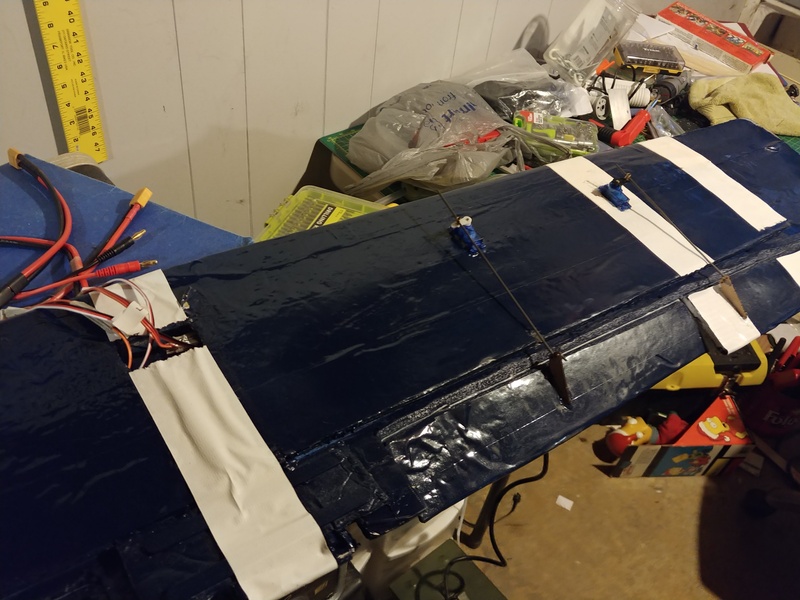 Put in a 920KV motor, 50A ESC, probably swing an 11" or 12" prop, more permanent landing gear (my original wired landing gear kept popping off), and FLAPS! Never had flaps before, so I'm hoping for a unique and fun experience.i love watching STOL planes and I think this will give me something similar. Pics of the flap progress are down below. Oh yeah, I'm thinking of ripping the current motor/ESC out of my Mini Scout and slapping those in the Tiny Trainer so I can give it a whirl and see what it's like. the Tiny Trainer so I can give it a whirl and see what it's like. I can't believe you haven't flown that plane yet . Looking forward for you next post . Tis true. Although with your response, I may see about getting it up in the air pretty soon. If the darn wind would let up a little. Go crazy and fly it in the wind . I loved the video. Have you tried making it a little more nose heavy , helps especially in the wind. As far as over powered anything, I am all for that . I call them the electric chickens. Thanks for the tip @Wildthing , I may give that a try. Electric chickens...lol love it! So far I've got 14 undrilled firewalls and I haven't really fully cut up the dishpan yet. So this will definitely come in handy as the last time I flew my Simple Cub I cracked the firewall. 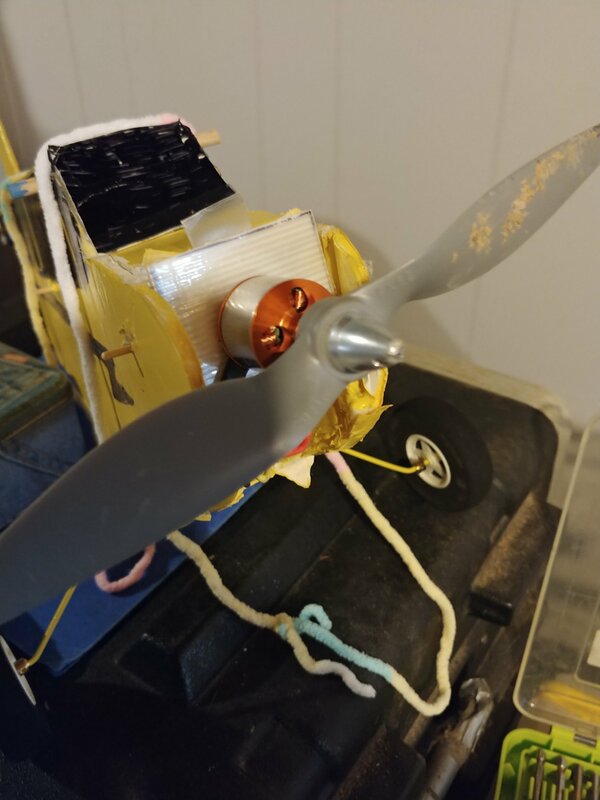 I put a Cf 2812 1534kV with a 7x6 prop on my MUTTS which is basically just a TT fuselage with a different wing and its performance was a revelation especially when you consider all of the extra weight added by its use of a tricycle undercarriage. Pretty cool firewall/power pod approach @Hai-Lee ! I was originally going to overpower the Mini Scout...but I may do the same for the TT too. Knowing me, I may try to find a good higher powered drone motor and use it, so the physical size won't be much bigger. 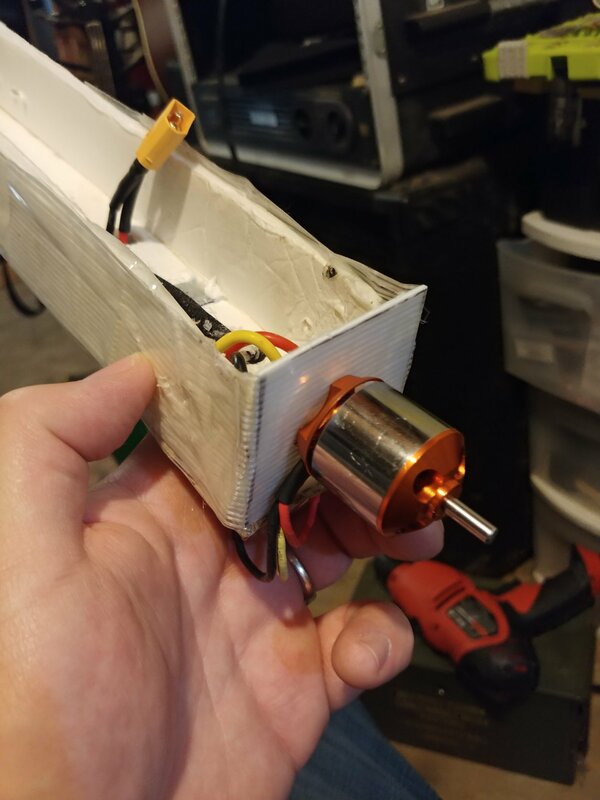 Just beware that some drone motors need a certain battery cell amount to work properly . I have 6 motors like that, that need a 6S battery to work . Wow, 6S! ...that's crazy! I generally stick with 3S-4S...4 is about the highest I've went. I haven’t gone past 3S that why those motors are just laying around. Not a whole lot happened RC over the weekend. It was the Easter holiday, so a lot more family stuff. I did manage to transfer my motor from my FT Mini Scout to the FT Tiny Trainer so I can start checking out the TT. My original FT Mini Scout airframe is basically going to be trashed. Gonna rebuild to make a sporty version. Oh...some electronics I had been waiting on finally came in. I find that one of my weak areas is linkages. Not so much I have problems in that area...all my linkages are pretty strong and I've never had an issue with them. It's just one of the areas I don't like doing when it comes to RC planes. I procrastinate horribly on it. And I think that's b/c I have been using some extra small linkage stoppers that seem to require extra drilling of the hole to make sure my pushrods fit. I made a thread about it earlier. I am going to try and fix that though by getting larger/better/different linkage stoppers. I just want a linkage stopper to be a simple pop it in and tighten it up and be good to go. Not to have require some babying and adjusting to get it right. It's an important part too I know. I did manage to get 2 of my plastic firewalls installed....one on my Simple Cub and one on my Storch. The Cub will probably get tested first...Storch still is a little ways from being tested. Cub pics are below. Looking forward to today as I'm gonna do some RC parts shopping...the linkage stoppers, some new props, motor, and maybe start my FPV camera journey.